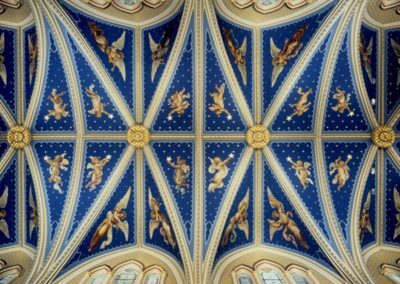 CSS has been providing decorative restoration at the Catholic University of Notre Dame in Indiana since 1933, when Conrad Schmitt first conserved the Luigi Gregori murals in the Gothic-style Sacred Heart Church (1887). 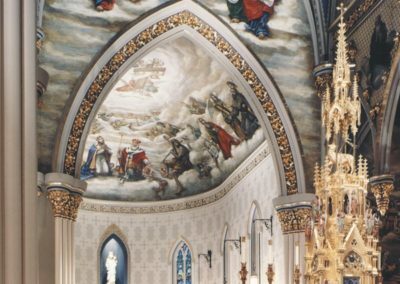 The Studio also provided decorative painting for the church in the 1960s. 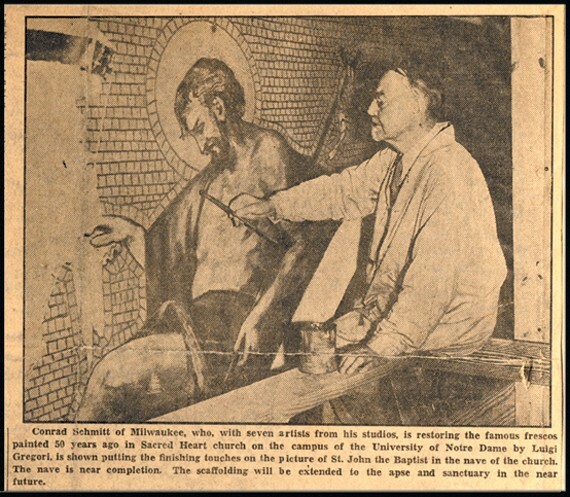 In 1989, water damage precipitated an extensive investigation and restoration of Sacred Heart’s decorative painting, murals and stained glass by the Studio. 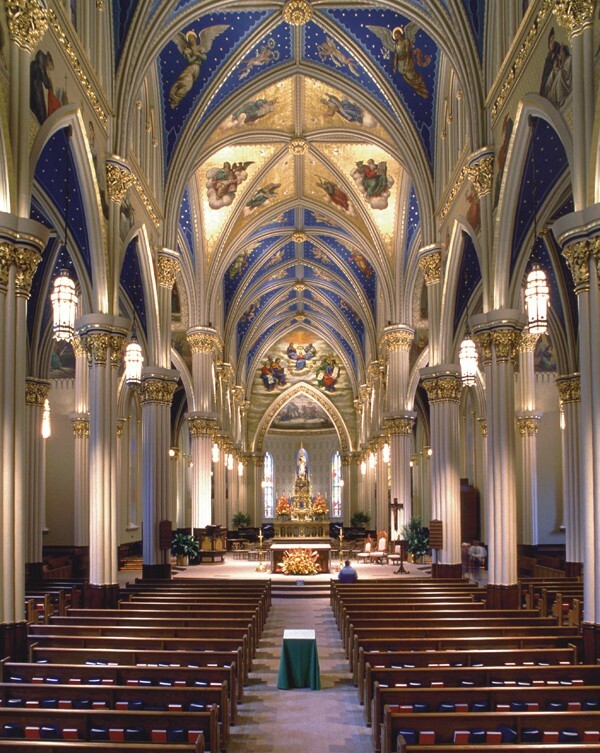 In 1992, Pope John Paul II designated the campus church a Basilica. 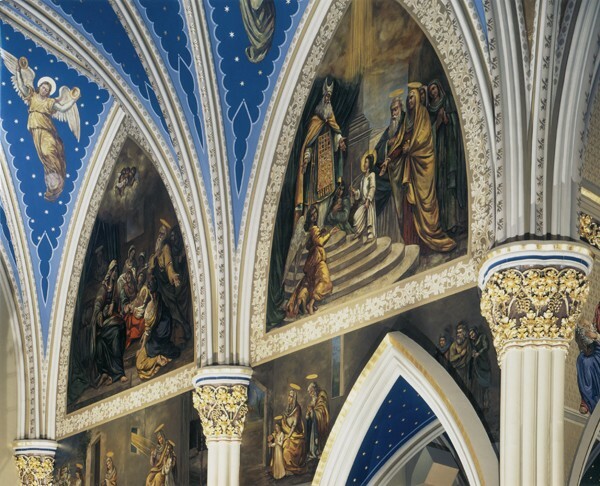 In addition to the work at the Basilica, CSS investigated the original decoration of the landmark Main Building in 1998, which revealed an elaborate decorative painting scheme that had been completely painted over. 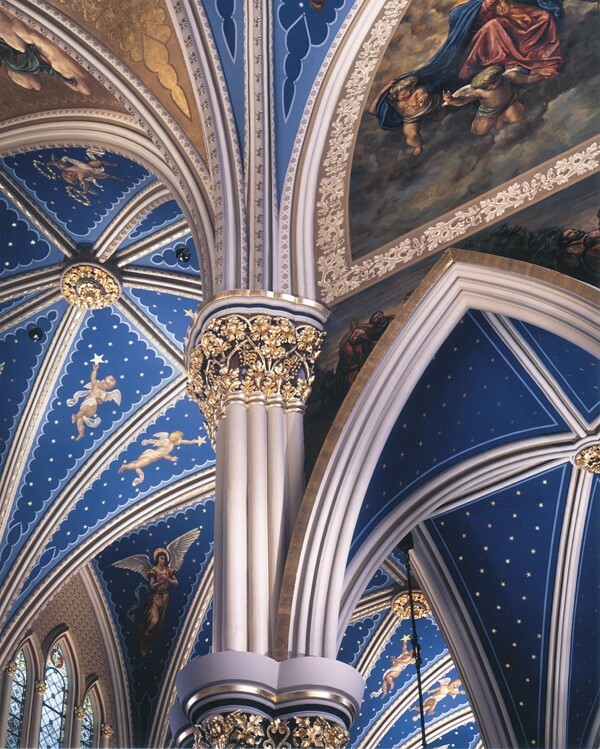 Studio artists restored the ornamental painting and trompe l’oeil work in 1999. 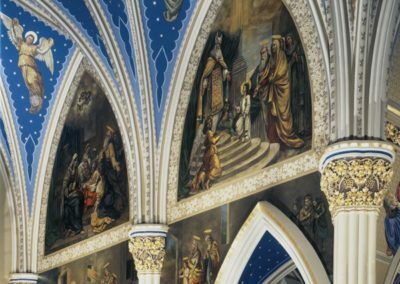 They also conserved the series of twelve Columbus-themed murals originally by Luigi Gregori for the main corridor. 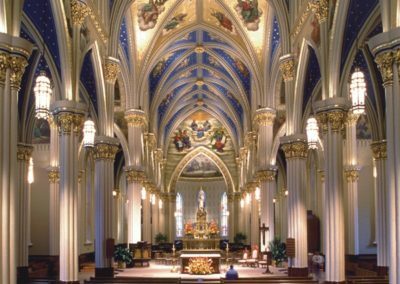 Restore the interior of the University of Notre Dame’s Basilica of the Sacred Heart, which included murals by Luigi Gregori, and conserve 1,200 stained glass panels originally created by the Carmel du Mans studio in Le Mans, France in 1873. 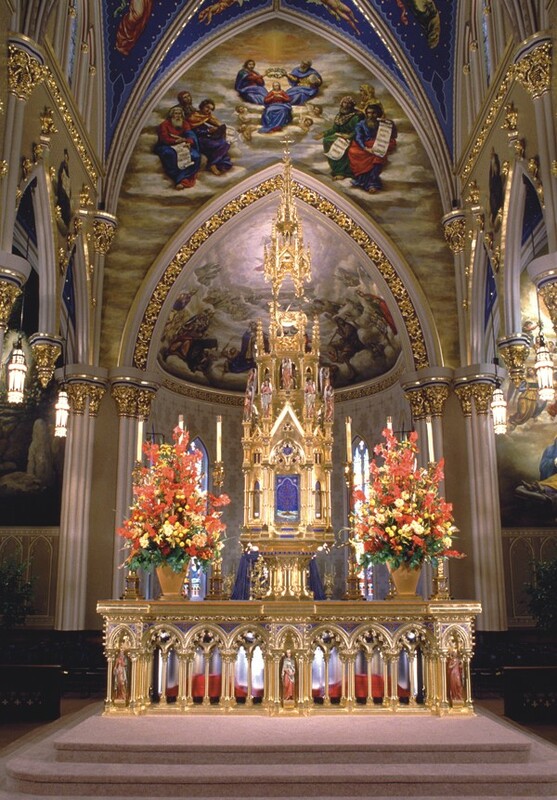 The windows suffered from areas of bulging, deteriorated lead, cracked pieces of glass and faded paint. 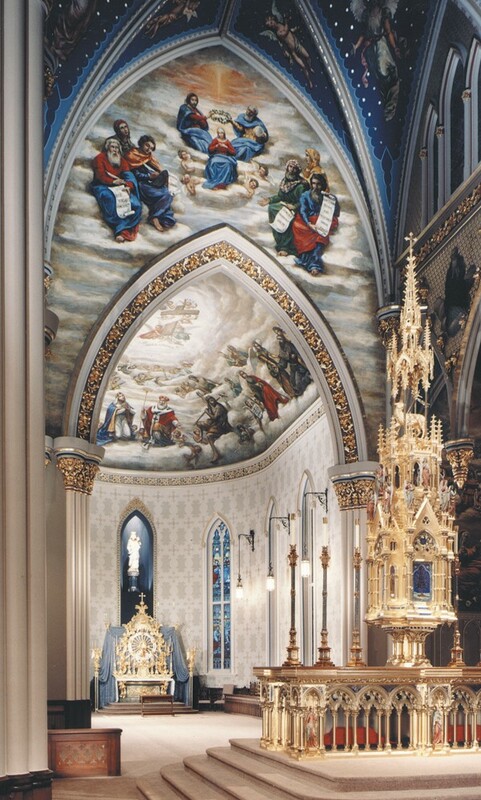 After investigating and documenting the original decorative scheme, the artisans and craftspeople at Conrad Schmitt Studios developed a plan for its restoration. 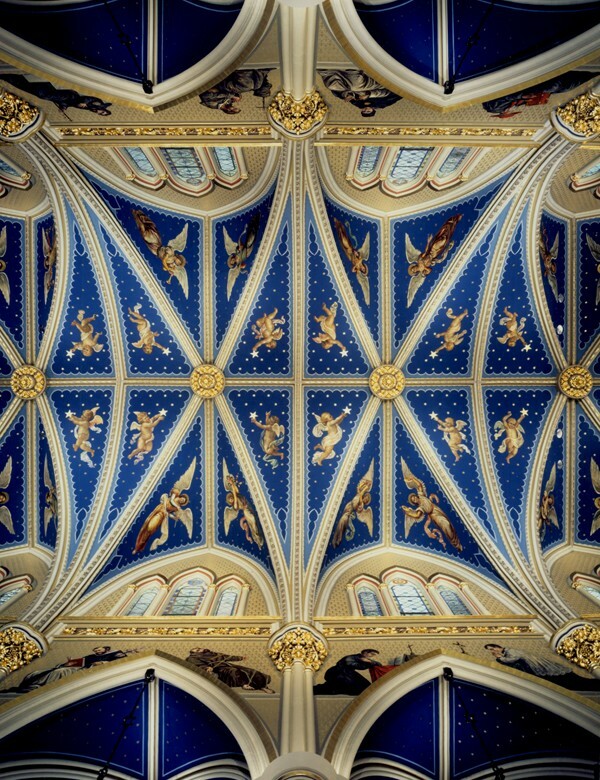 This plan included the execution of a decorative sample that assisted in generating interest and funds. 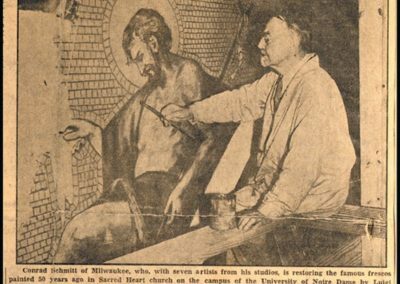 Conrad Schmitt Studios was awarded the monumental task of conserving the stained glass windows. 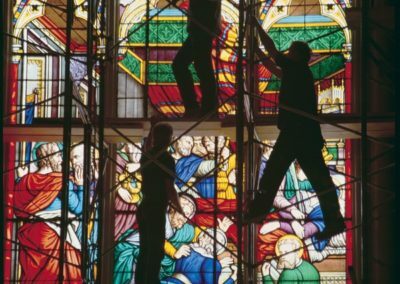 With 116 windows totaling over 1,200 panels, this was one of the largest stained glass conservation projects in the United States. 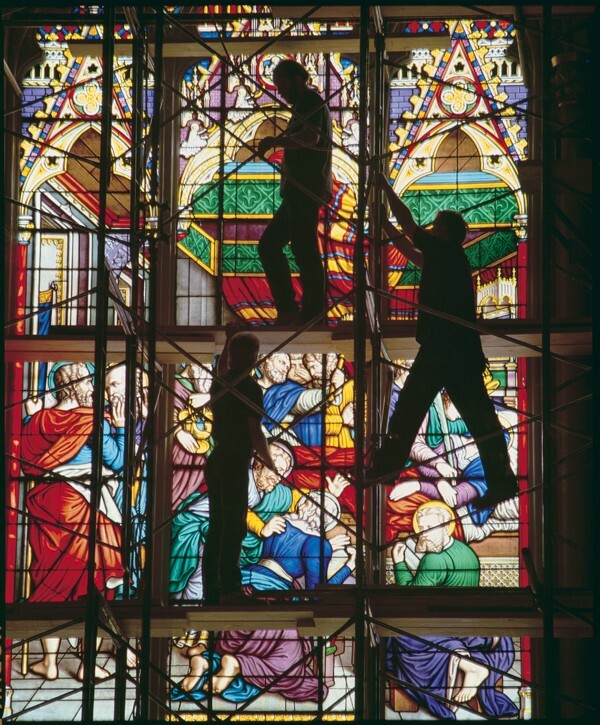 The stained glass windows were photographed, carefully documented, and deleaded. Missing and faded paint was replicated on 2mm slide glass and then sandwiched to the original piece of glass. 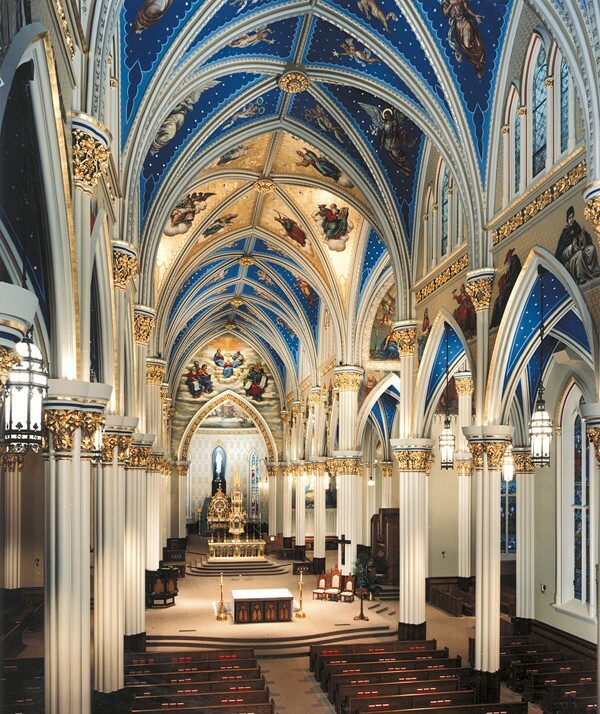 The windows are once again a source of beauty, education and inspiration. 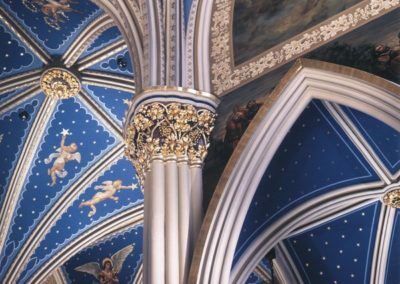 View additional Cathedral & Basilica before/after restoration photos here in this 4 minute slideshow. 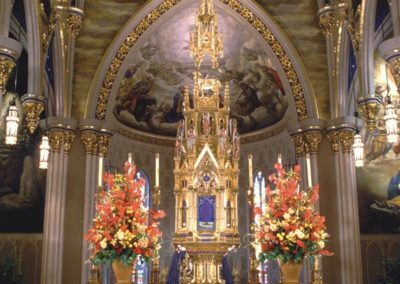 View the following CSS produced stained glass videos highlighting the conservation of the historic stained glass windows at the Basilica of the Sacred Heart, University of Notre Dame, Notre Dame, IN.